Where can I get the money to start? We talk about making capital investments to save money a lot here. But wait, what if I can just about pay the bills now? How can I get some extra money together to pay for insulation, double glazed windows, an electric car and a solar PV array? The answer is to start with behaviour. Changing that costs nothing, and can save us a hell of a lot. Let’s simplify all energy costs into one figure for simplicity. We can then compare all behaviour changes A kWh costs about €0.17 / $0.20, averaging electricity costs, natural gas and gasoline/diesel costs per kWh. That means we can save about $1 a day per 5 kWh. Where can these savings come from? Heating a house is one of the biggest portions of our energy bill and the energy consumption is simply a function of the temperature difference between inside and outside. In cold weather, wearing a jumper and turning down the heat to 15-17C would save 20 kWh of heating a day (that’s more than your entire electricity consumption), about $1,500 a year. The same goes for air conditioning in summer if you use it – the closer to the outside temperature your house is, the less your heating and cooling energy costs. Driving consumes 80 kWh per 100km in an average car. Cycling consumes 2.4kWh per 100km. (Your car is powered by oil, your bike is burning energy that would otherwise become fat reserves on your body). An average car commute will consume about 40 kWh, which can be done for about 1.2kWh on a bike. Cycling to work here could save about $2,800 in fuel costs alone. Are you hard-core enough to do all of these? That’ll save you $9,000 a year. 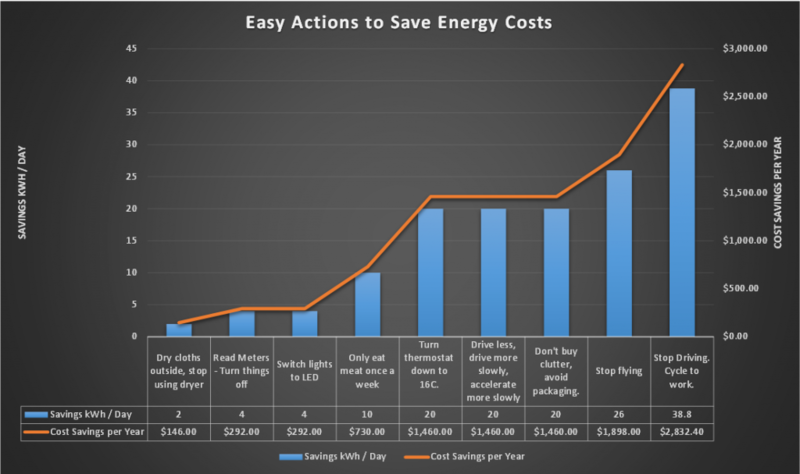 That’s enough to buy a Solar PV system after one year, which will increase these savings to about $10,500 in year 2. That’s enough for a double glazing and a wood burning stove, and we’re up to about $13,000 saved in Year 3. And so it will go.